Iceland appears to many a country shrouded in mystery and legend, and marked by contradiction: a part of Europe, and yet separated from it by the Atlantic Ocean; seemingly inhospitable, and yet home to more than 300,000 souls. Wasteland with Words explores the evolution and transformation of Icelandic society and culture, investigating the literary and historical factors that created the rich cultural heritage enjoyed by Icelanders today. 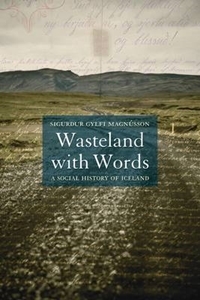 Sigurdur Gylfi Magnusson presents a wide-ranging and detailed analysis of the island's history, examining how a nineteenth-century economy based on the industries of fishing and agriculture - one of the poorest in Europe - grew to become a disproportionately large economic power in the late twentieth century, while retaining its strong sense of cultural identity. The recent economic and political collapse of the country is also assessed, in the light of the historical development of the island. With a focus on the lives of individual Icelanders throughout, the book seeks to chart the vast changes in this country's history through the impact and effect on the Icelandic people themselves. "Wasteland with Words" is a comprehensive study of the island's social and historical development, from tiny fishing settlements to a global economic power. It will appeal to anyone interested in or studying this most enigmatic of islands, and also to those interested in cultural and social history as a whole.